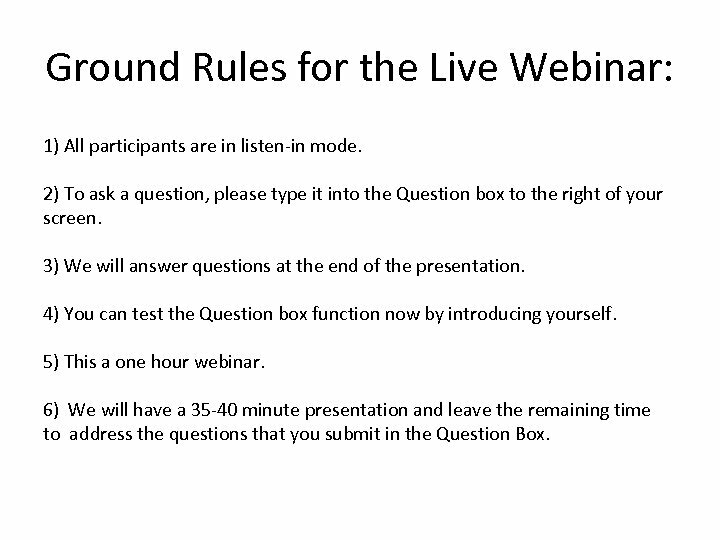 Ground Rules for the Live Webinar: 1) All participants are in listen-in mode. 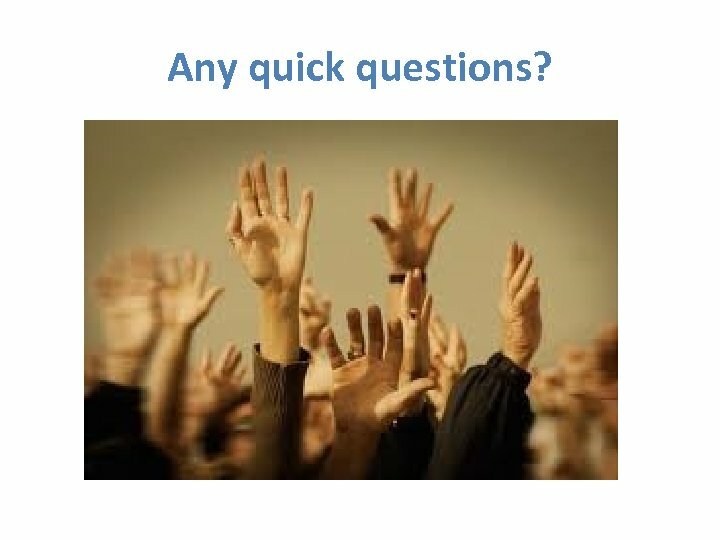 2) To ask a question, please type it into the Question box to the right of your screen. 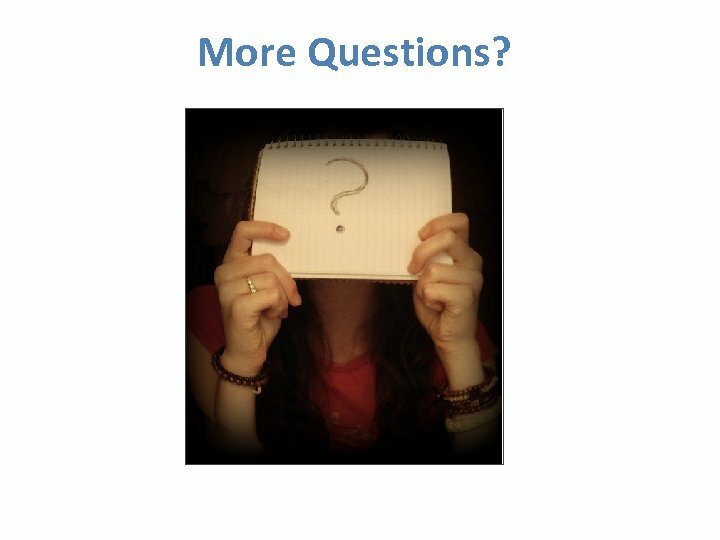 3) We will answer questions at the end of the presentation. 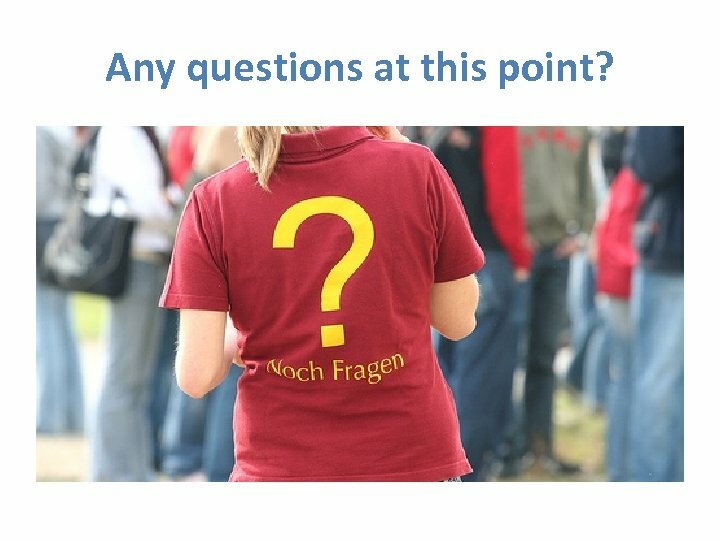 4) You can test the Question box function now by introducing yourself. 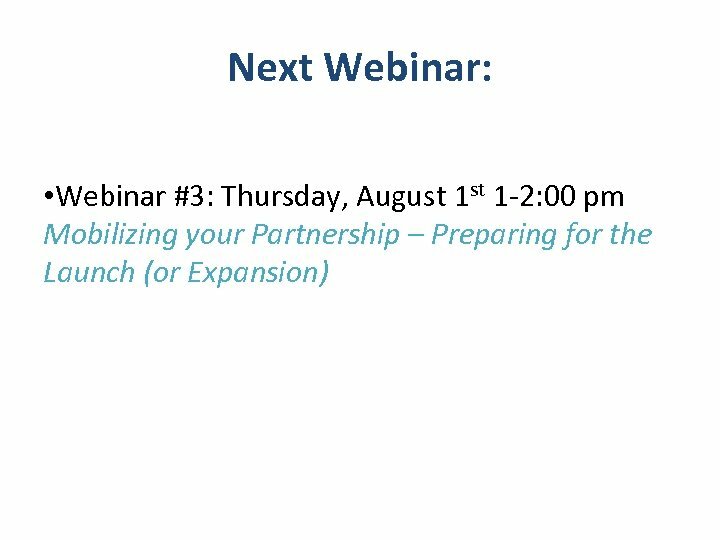 5) This a one hour webinar. 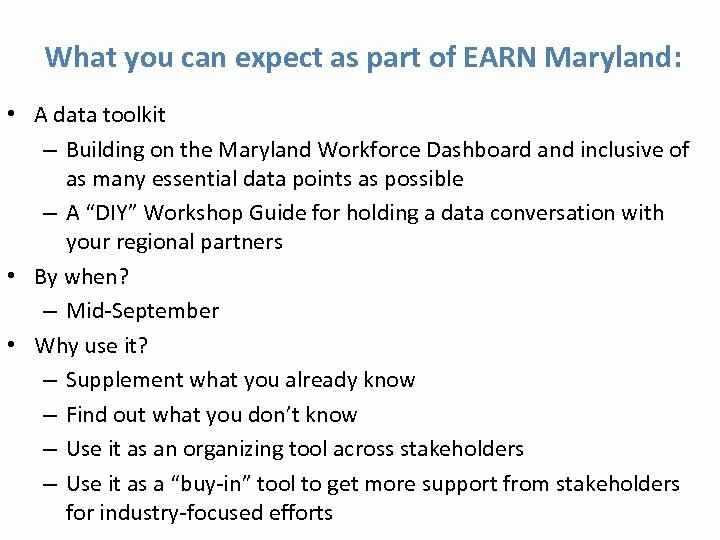 6) We will have a 35 -40 minute presentation and leave the remaining time to address the questions that you submit in the Question Box. 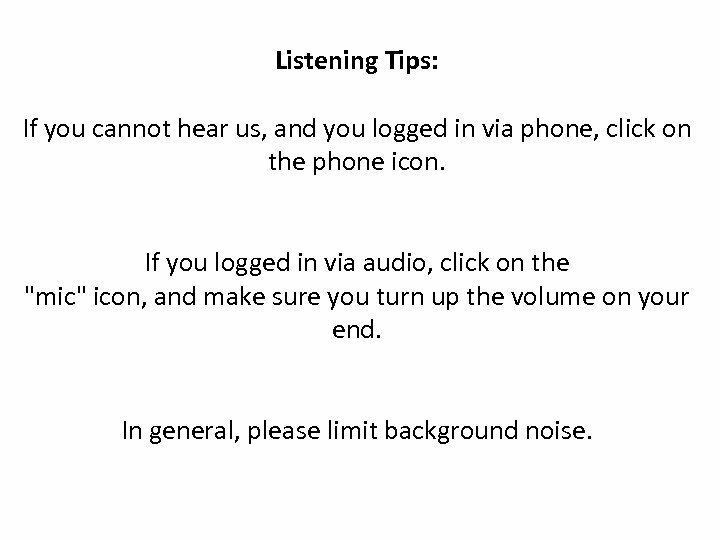 Listening Tips: If you cannot hear us, and you logged in via phone, click on the phone icon. If you logged in via audio, click on the "mic" icon, and make sure you turn up the volume on your end. In general, please limit background noise. How many IPs should one region have? 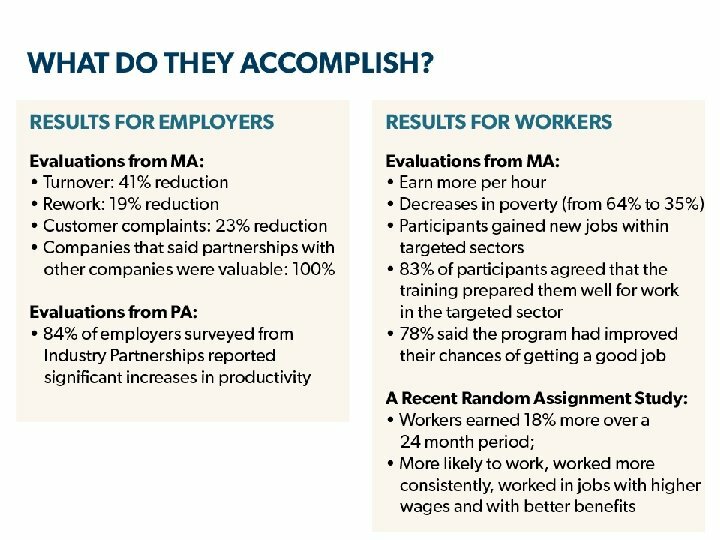 • Depends on your region’s labor market (how many sectors really drive your local economy? ) 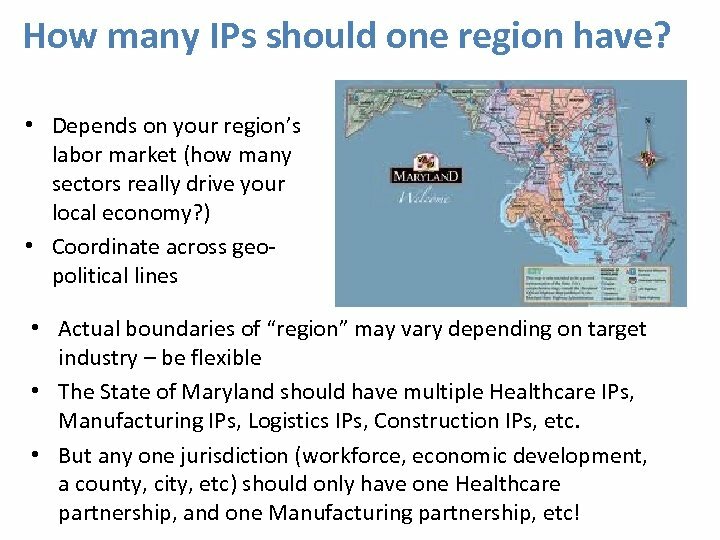 • Coordinate across geopolitical lines • Actual boundaries of “region” may vary depending on target industry – be flexible • The State of Maryland should have multiple Healthcare IPs, Manufacturing IPs, Logistics IPs, Construction IPs, etc. 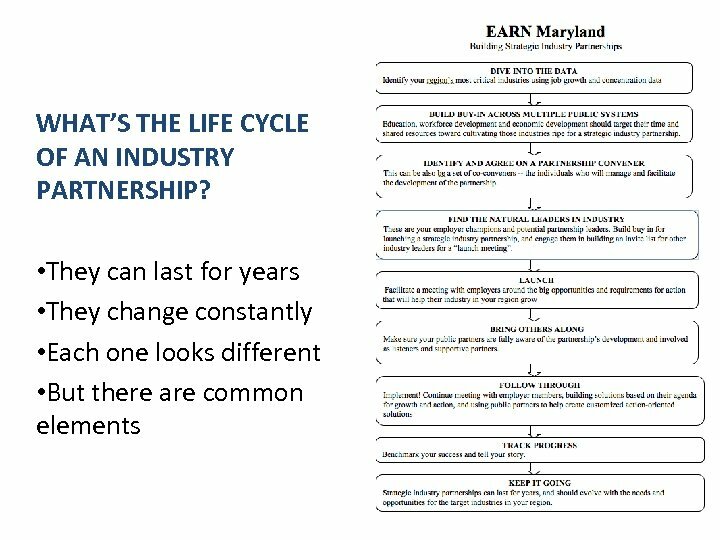 • But any one jurisdiction (workforce, economic development, a county, city, etc) should only have one Healthcare partnership, and one Manufacturing partnership, etc! 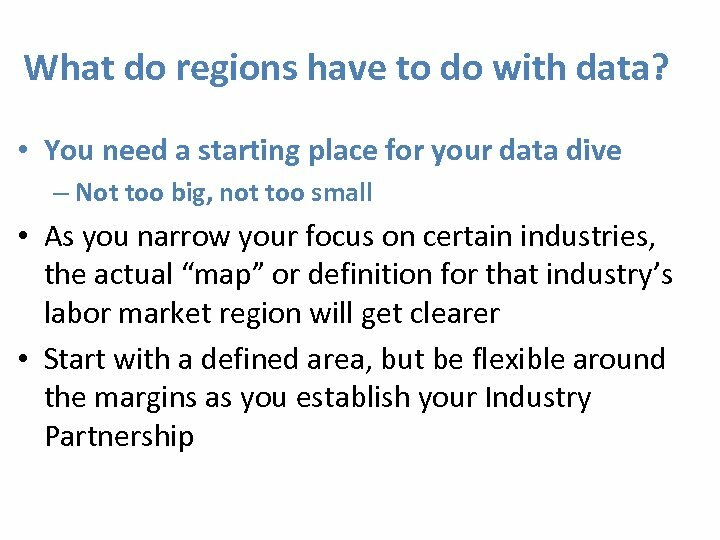 Why are we talking about regions when IPs are about industries? 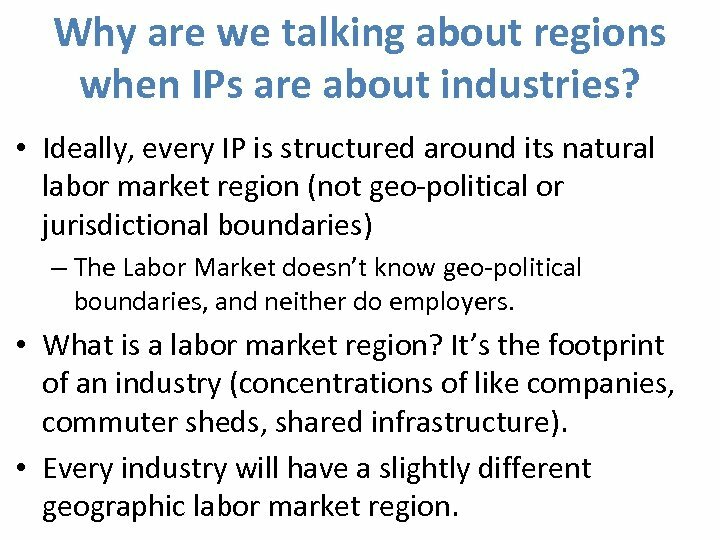 • Ideally, every IP is structured around its natural labor market region (not geo-political or jurisdictional boundaries) – The Labor Market doesn’t know geo-political boundaries, and neither do employers. 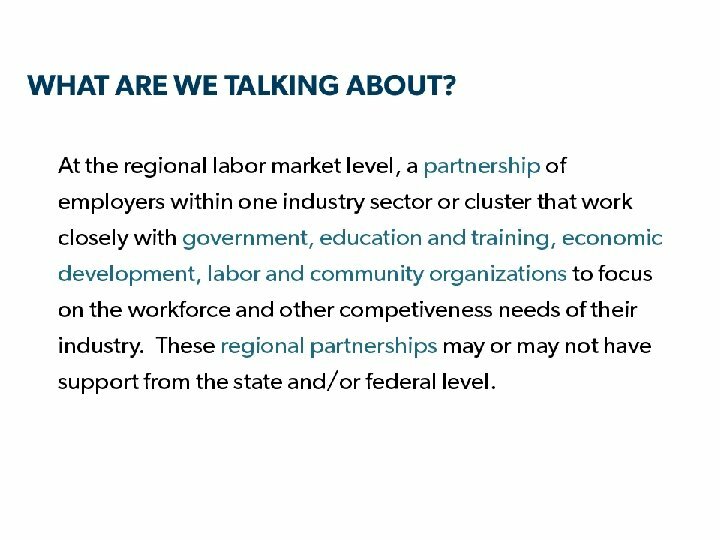 • What is a labor market region? It’s the footprint of an industry (concentrations of like companies, commuter sheds, shared infrastructure). • Every industry will have a slightly different geographic labor market region. Any questions at this point? 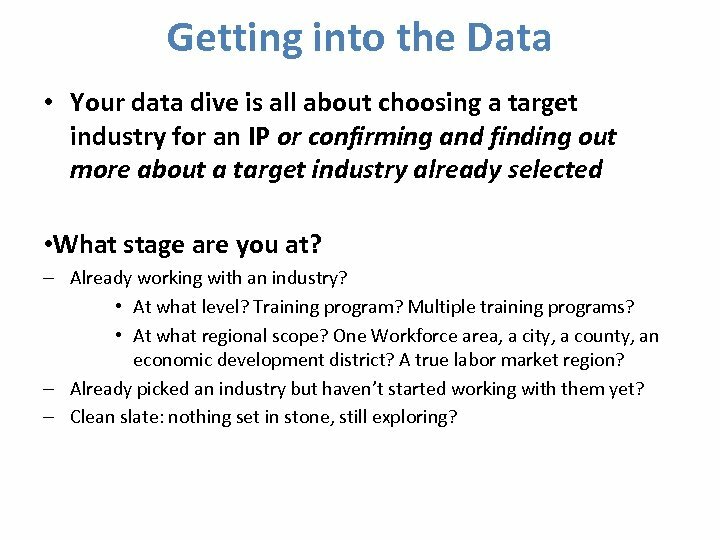 Getting into the Data • Your data dive is all about choosing a target industry for an IP or confirming and finding out more about a target industry already selected • What stage are you at? 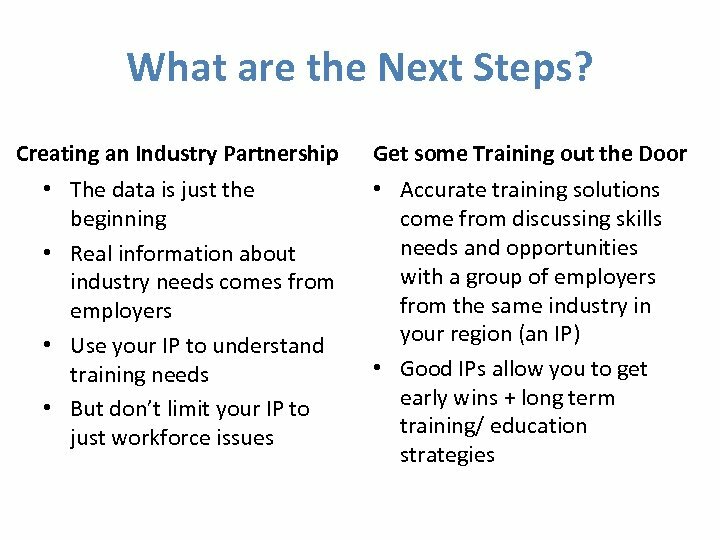 – Already working with an industry? • At what level? Training program? Multiple training programs? • At what regional scope? 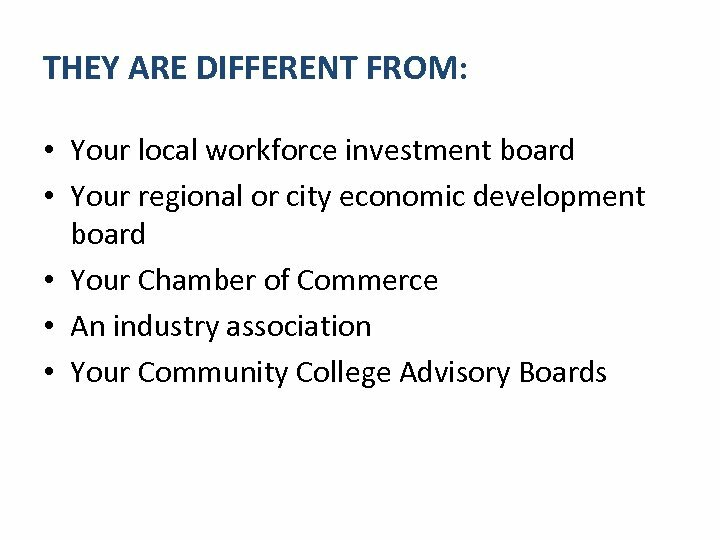 One Workforce area, a city, a county, an economic development district? A true labor market region? 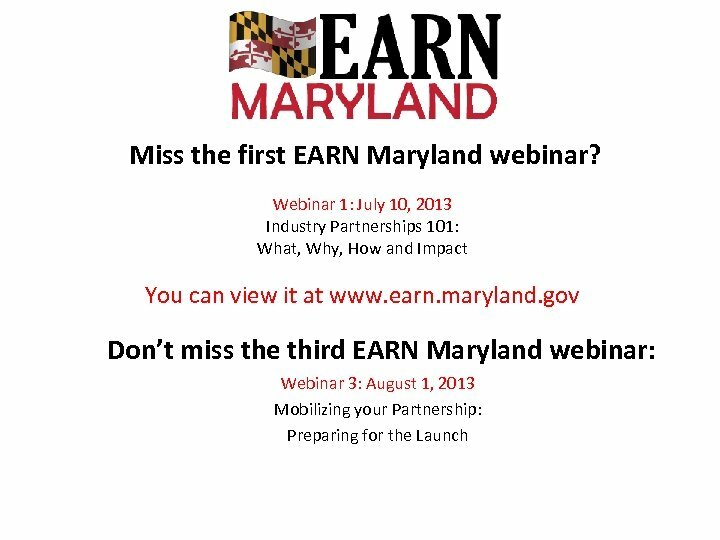 – Already picked an industry but haven’t started working with them yet? – Clean slate: nothing set in stone, still exploring? 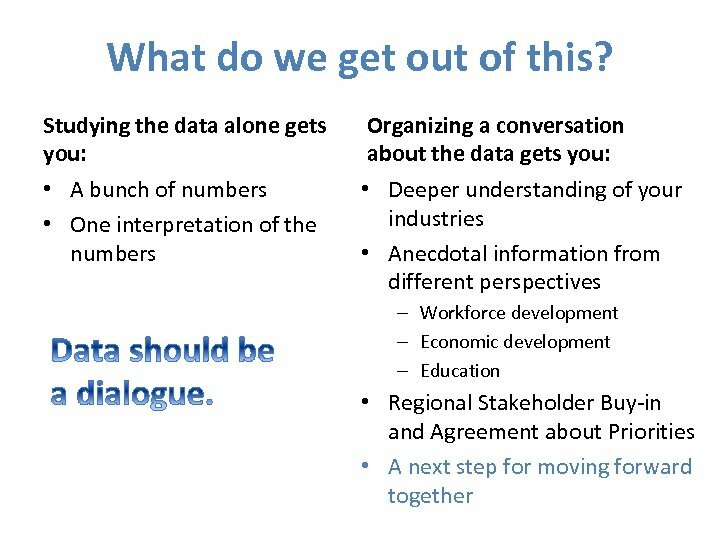 Which data points matter most? 1. Current Employment 2. Short term change in Jobs (2 years) 3. Long term change in jobs (10 years) 4. Current and past Location Quotients 5. Current wages 6. # Establishments 7. Average # Jobs per Establishment 8. Job Growth Projections 9. 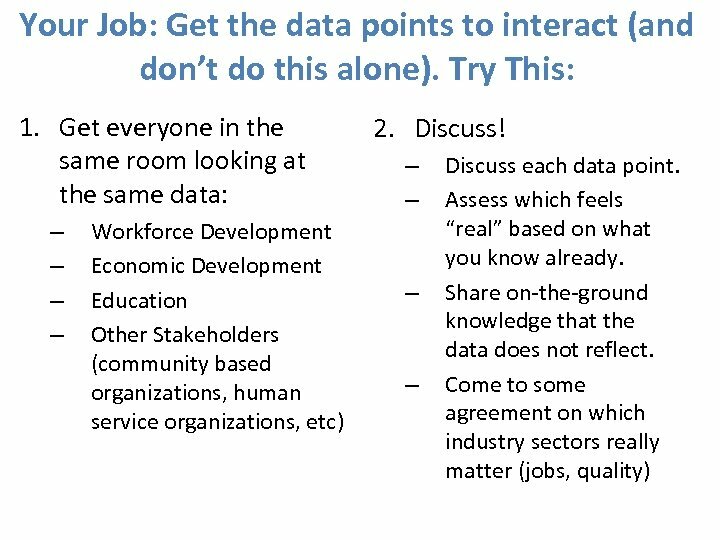 Occupational data 10. 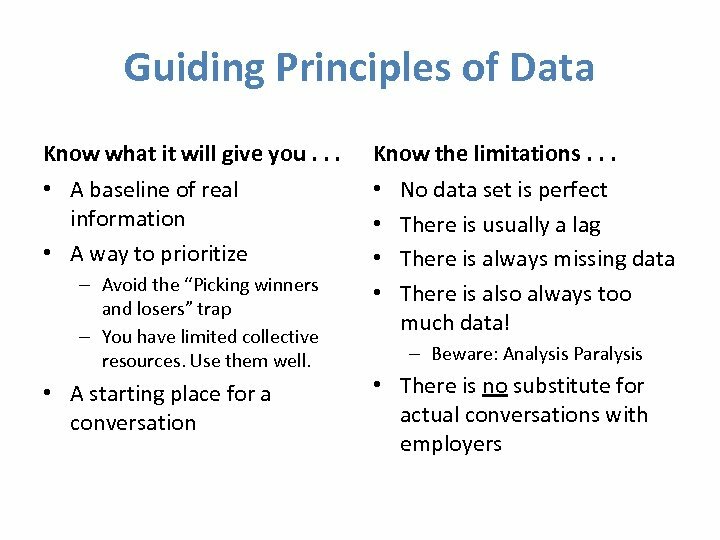 Your on-the-ground knowledge What if you don’t have all these data points? Work with what you have. Discussion Questions 1. Current Employment: Which sectors are your biggest employers? Moderate employment? Smallest employment? 2. Short term change in Jobs: Any upticks? Any rapid declines? Which show strongest combination of absolute and percentage change? 3. Long term change in Jobs: Which sectors have added the most jobs in the past decade? Which have highest long term growth rates? Which reflect growth over long and short term? 4. Current and past location quotients: Which sectors have an LQ above 1. 0? Which have the highest LQs? Is there an industry sector that shows an increase in LQ over time? If so, it’s growing faster in your region than the national average. 5. Current wages: Which sectors show the highest and lowest average wages? 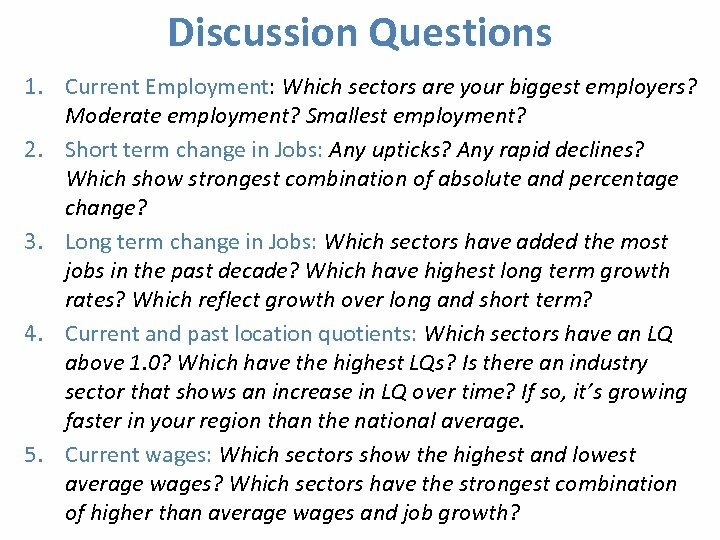 Which sectors have the strongest combination of higher than average wages and job growth? 6. 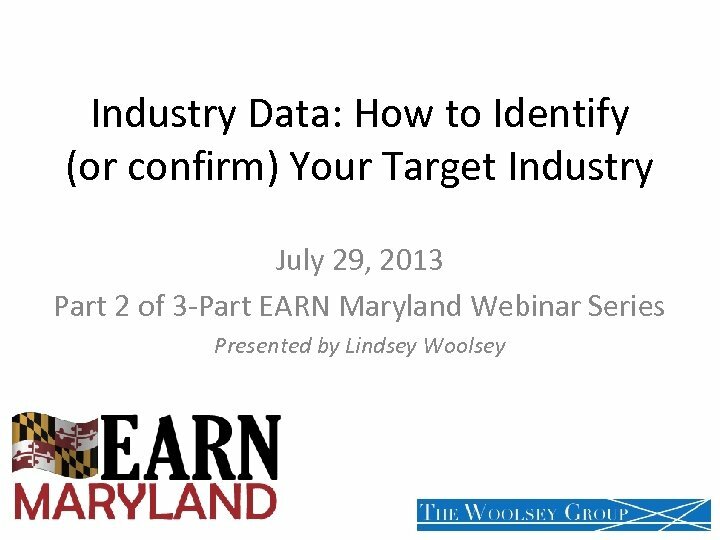 # Current Establishments: Which sectors show the largest # of actual firms/companies? 7. 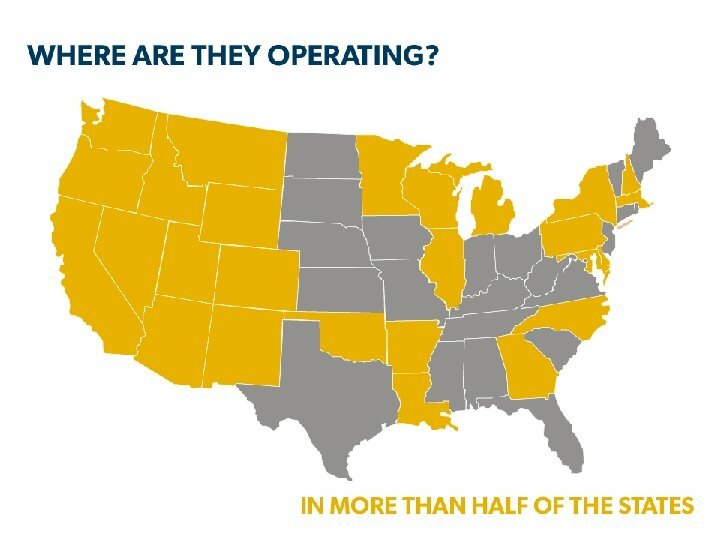 Average # jobs per Establishment: Which have the highest # jobs per firm? Which have the lowest? Which have the highest # of establishments but low # jobs? 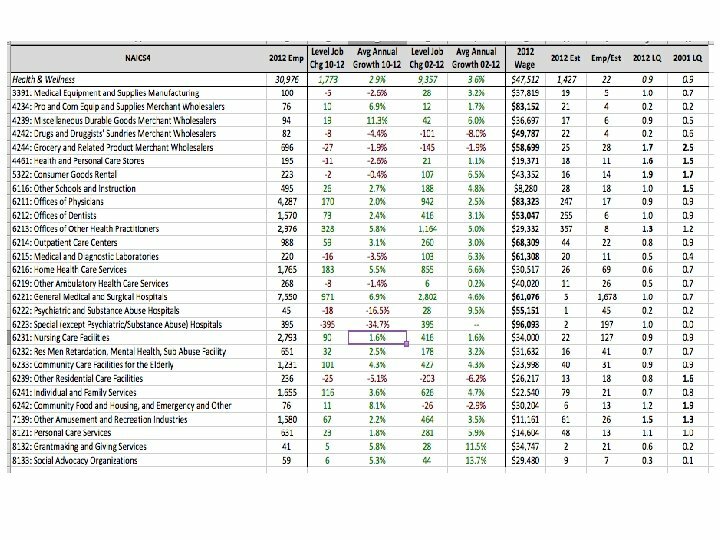 Which have the lowest # of establishments but high # of jobs? 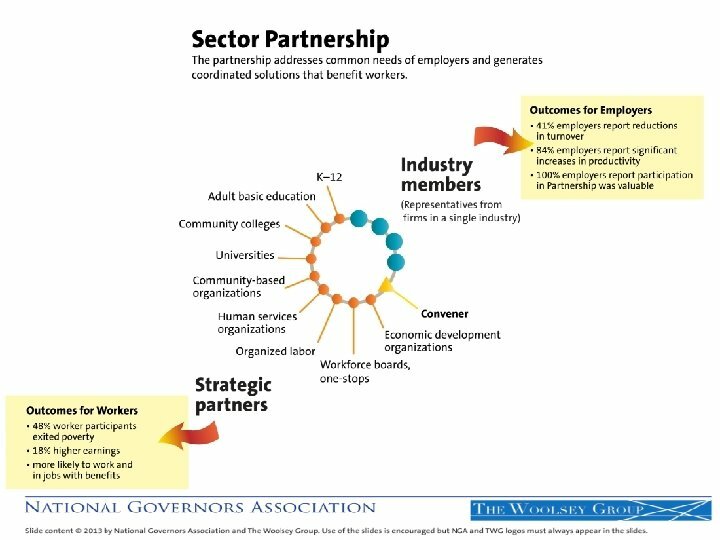 What does this say about the structure of the sector? 8. Job Growth Projections: Which sectors show growth? 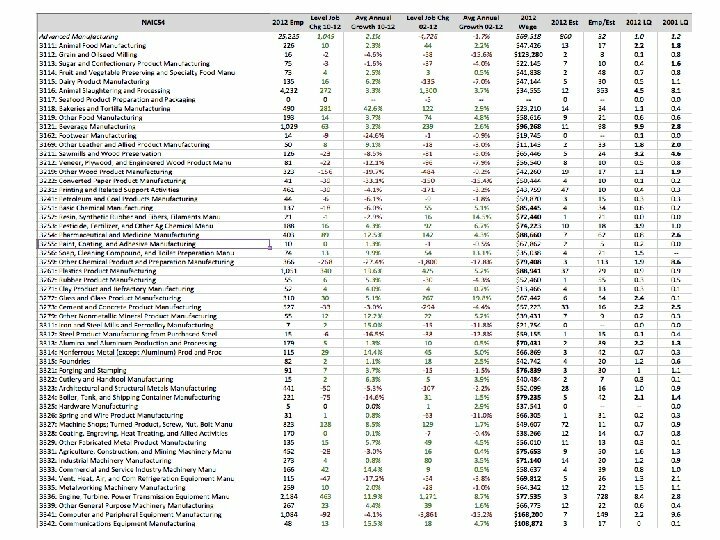 Which show strongest combined growth in absolute #s and percentages? 9. 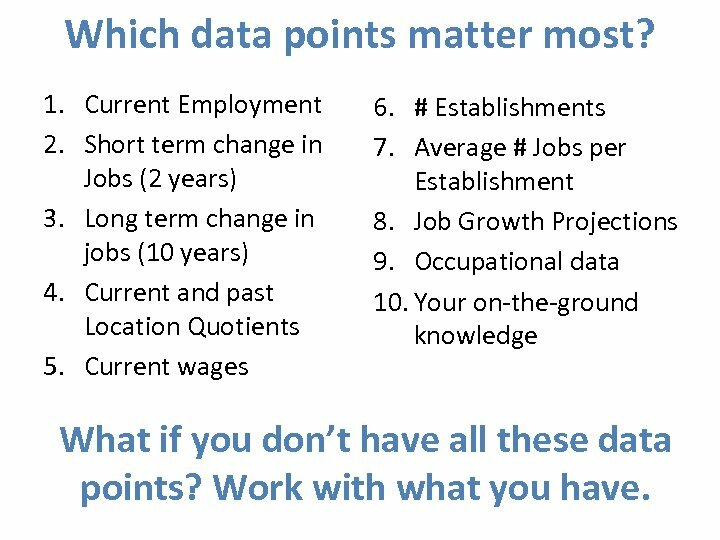 Occupational Data: What are the top occupations in terms of jobs and family-sustaining wages in your potential target sectors? Are there occupations that cross multiple sub-sectors of an industry? 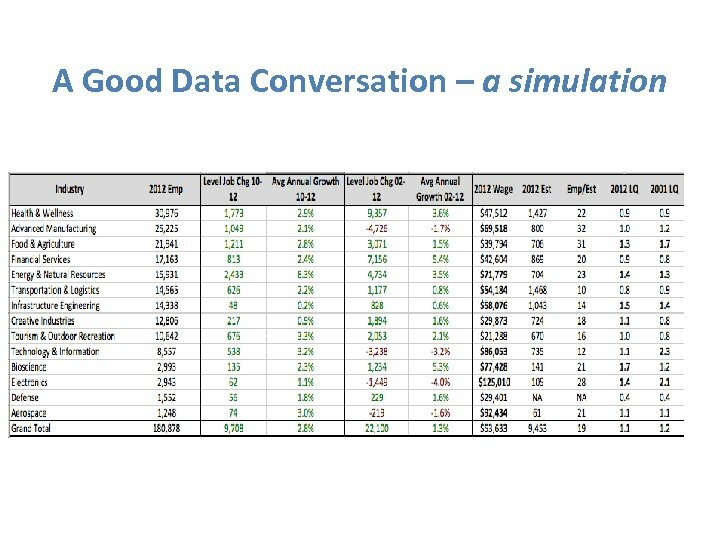 What does the data show in terms of projected new growth and replacement needs? What are the skills requirements? 10. Your On-the-ground Knowledge: What do all the combined above inquiries yield? What do we know anecdotally about certain sectors? 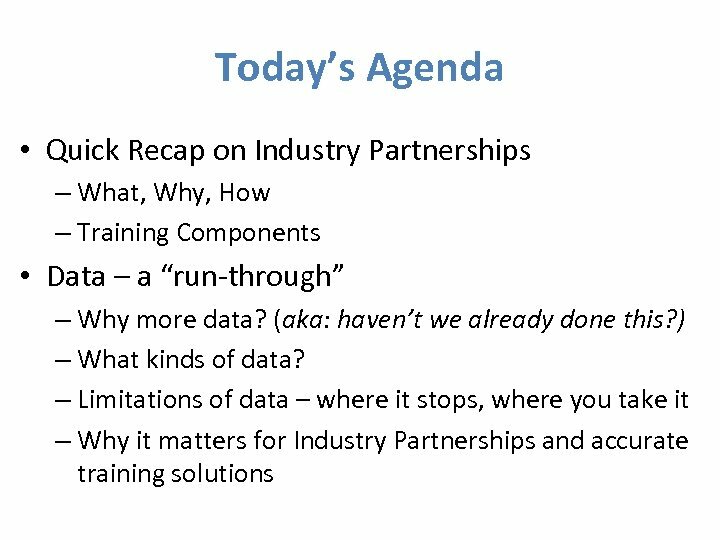 What’s the culture of the industry? 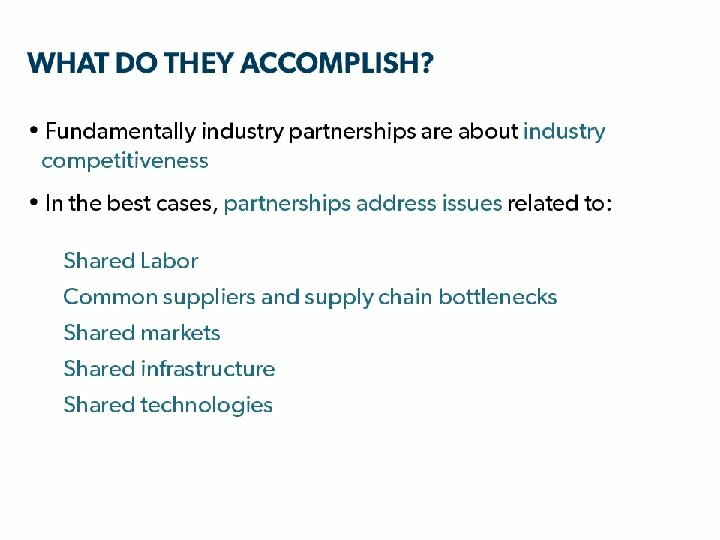 Readiness of industry to collaborate? Willingness of industry to invest in solutions? Other timing considerations? What are our individual and collective relationships?